Imagine a wall charger with a magnet on it. 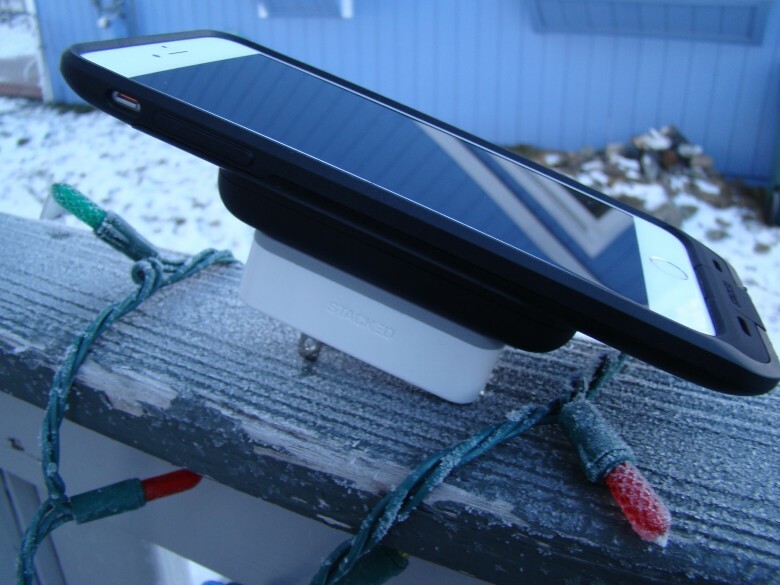 Then imagine an iPhone case that sticks right to the wall charger and recharges your iPhone while it hangs there. Add a 2,750-mAh battery pack that also sticks to the charger and the iPhone, and you can start to get the sense of how interesting Stacked’s modular design is. Plug the wall unit in, stack up to five battery packs on it, then stick your iPhone on top of that for a full overnight charge for both the packs and the iPhone. Take the battery packs in your backpack and you’ve got an endless supply of little power jolts that will get you through the heaviest day of usage. When you get home and just need the iPhone charged, stick it to the wall charger and it’s ready in no time. The iPhone case is easily installed onto your iPhone 6 or 6 Plus (as well as the “s” versions of each): Just pop your iPhone into the bottom edge of the case, slide up the Lightning connector, pull the flexible material over the top of your iPhone, and it’s ready to stack and charge. Better yet, each battery pack can be charged and used for other devices via USB cable, making this one extensible, useful system. The Stacked comes in black, white or gold and will run you an affordable $130 for the wall charger, iPhone case for either the 6/6s or 6/6s Plus, and one battery pack. You can grab extra packs for $58 each. Cult of Mac’s Best List is a roundup of products that make us want to fly like an eagle. Read more Best List mini reviews.